The song “Perfect Day” was originally written and recorded by Lou Reed in the early 1970s. In 1997 the song was re-recorded with a variety of artists including Reed himself. Bono was part of the group of musicians who sang a line on this new version of the song. A video was shot as a tribute and to promote the BBC’s support of live music. It featured the stars singing one line each, with Reed singing the first and last line. To go with the video a CD was released containing the video version of the song as well as a male and female version of the song. Bono can be heard on the main version of the song, as well as in the “Male Version” of the song. He is not present on the female version of the recording. Bono’s lines were recorded in New York, as well as his segment of the video, while the band was on the PopMart tour. The single when it was released held the number 1 spot in the UK for three weeks. In 2000, the show Music Live on the BBC network planned a mass singalong of the song including performers and audiences from all over the UK including Jools Holland, Boy George, Heather Small, Ronan Keating, The Corrs, Steps and Craig David. Estimates place close to 100,000 voices singing the song. Leading into the event a version of the single was released in a regular jewel case with an instrumental version of the “Perfect Day” song with the BBC Music Magazine, so people could sing along to the instrumental track. It also included a track “Beat This!” which featured seven of the world’s greatest percussion groups creating a drumming motif. It was designed to be played by percussion groups all over the UK on Monday 29 May at midday as part of the Music Live’s Perfect Day. 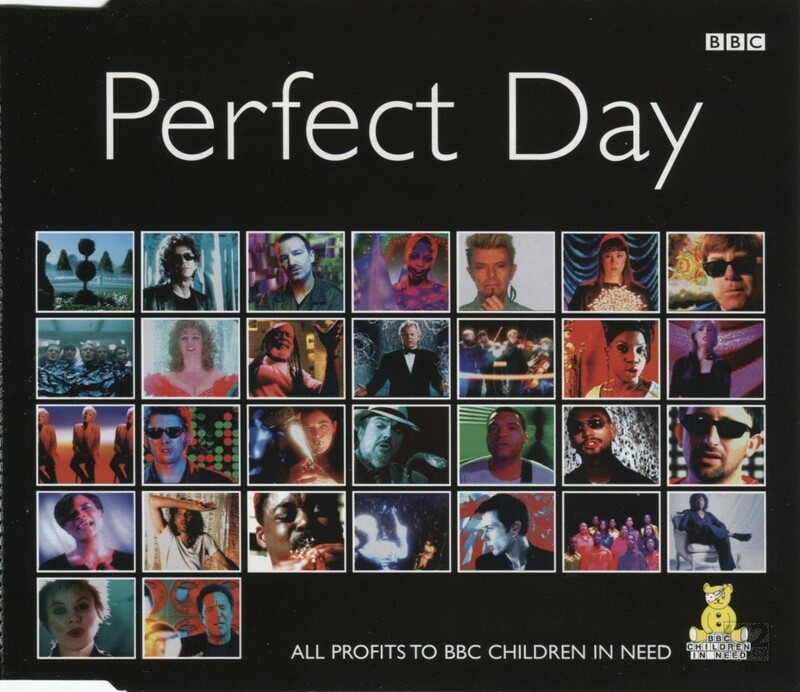 The final version of “Perfect Day”, with 100,000 voices was in high demand to be released on CD, so the BBC went back into the archives and re-released the Perfect Day single, with two extra tracks this time – one is a video of the original ’97 version of the song. The other extra track was the live recording, which did not feature Bono. The proceeds of the re-release also went towards the BBC Children in Need Appeal, like the original had before. Although the show was watched by millions, the single release only reached #69 upon release. Lou Reed, Bono, Morcheeba, David Bowie, Suzanne Vega, Elton John, Boyzone, Lesley Garrett, Burning Spear, Thomas Allen, Heather Small, Emmylou Harris, Tammy Wynette, Shane McGowan, Dr. John, Robert Cray, Huey (Fun Lovin’ Criminals), Ian Broadie, Garbrielle, Evan Dando, Brett Anderson, Visual Ministry Choir, Joan Armastrading, Laurie Anderson, Heather Small, Tom Jones. Instrumentals by the Broadsky Quartet, Sheona White, Courtney Pine, Andrew Davis, BBC Symphony Orchestra. Music and words by Lou Reed (1973). All artists, the BBC and Chrysalis Records agreed to waive royalties. The proceeds of the sale of this single will benefit the BBC Children in Need Appeal.